Ah, the custom Dremel mod of yore, heh heh. I introduce the Oddball Mic Cables. I built a pair of adaptor ends to make a single XLR cable (Canare L4E6S) into a single run stereo cable, for use with the MMA6k. 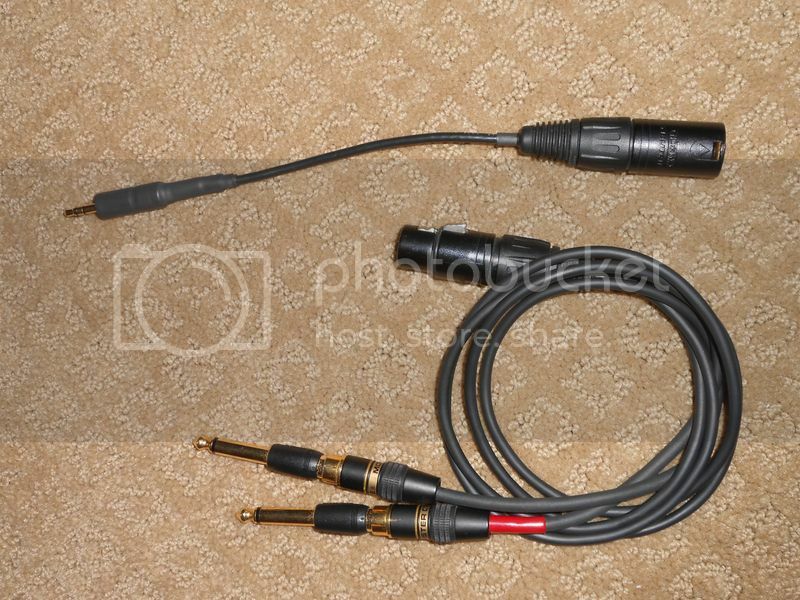 I built a 3.5mm TRS>3-pin xlr end to come out of the MMA6k, and at the other end, an XLR>RCAx2 connector end, to which i have a pair of RCA>1/4" TS adaptors that I can use with the Tas DR70D. In several recordings now, they have worked great. ^^^^ Nice, I like that Canare cable choice. reliable and pliant, not stiff. Williams' Stereo Zoom concept, and the more advanced multichannel array design which is an extension of it, has greatly influenced my thoughts on recording. His "Magic-Arrays" are a fascinating and penultimate extension of the concept, so called because they are designed to produce optimal 1, 2, 3, 4, 5, 6, 7, or 8-channel content simultaneously and without compromise from a single microphone array. One can't just keep adding microphones and expect it to work correctly. Things quickly get complicated as more microphones are used. The combination of spacing, angle, time-delay, and polar-pattern provide for "critical-linking" between each stereo pair segment all the way around the array, so that the edge of one stereo imaging section lines up with the edge of the neighboring section without a gap or too much overlap. This is a "purist recording" type setup where the number of active microphones used always equals the number of reproduction channels. There is no 'mixdown' of multiple microphones to a fewer number of reproduction channels intended (although the design should alleviate the problems inherent in doing so if one is so inclined). For lower playback channel counts, fewer microphones are active, yet the clever array arrangement retains "critical linking" between each recording segment and it's neighboring segment around the array. That means the edge of the reproduced image between each speaker pair lines up with the edge of the reproduced image from the adjacent speaker pair, so the stereo playback image is not anchored to the speakers or distorted as a sound source moves around the array. Rather, it pans optimally around the room without getting "stuck" at the speakers, without "hole in the middle" problems, and without being overly monophonic and center heavy between any particular speaker pair. Another interesting thing about this is that because the array is symmetrical, we can choose which direction we wish to point it afterwards by 90 degree intervals. 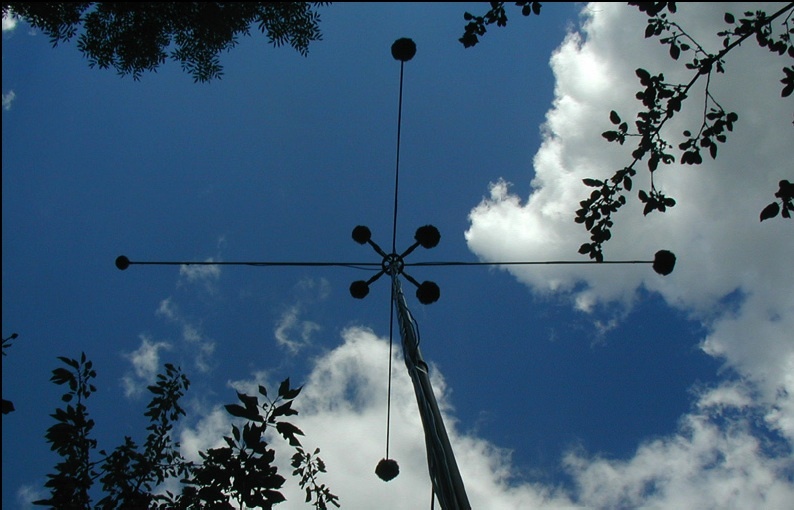 By re-routing the recorded signals, we can point the array forward, 90 degrees left or right, or backwards, designating the cardinal direction as the center in the resulting playback. An identical microphone pickup pattern is used for all channels, and any directional pattern from supercardioid to hypocardioid may be employed. The spacing between microphones is determined by the choice of pickup pattern. Using all supercardioids requires significantly less spacing between microphones than using all hypocardioids. Here's a simplified explanation of how the "8-channel Magic Array" pictured above works, lets assume using we are using cardioid microphones all the way around. For mono, only the center forward-most microphone is used, producing single channel mono from a single forward facing cardioid. For 2-channel stereo, only the +/- 45 degree forward angled Left/Right pair close to the center, on either side of the forward most center mic are used, producing a DIN-like cardioid pair with a 90 degree SRA pickup angle. For 3 channel stereo (LCR) the center microphone is used along with the L/R microphone pair. The center microphone is positioned relatively far in front of the L/R pair, and is time-delayed to bring it into alignment with them. That does several things: the imaging between the +/- 45 degree L/R mic pair in the L/R speaker pair is unchanged from the 2-channel stereo configuration. The center mic is positioned far enough away from that pair to have it's diffuse-field pickup (the ambience, reverb, audience reaction, everything outside the SRA 'playback image' window) decorrelated from what the pair is picking up. This avoids the problem of "too many mics, positioned too close together, with the intend of mixing them" which I've posted about here at TS. That's a common problem for tapers running 4-channels consisting of two typical stereo pairs mounted on the same stand with the intent of mixing them all together. In this case the combination of the extended spacing, the delay, and the angle difference between the center and Left microphones forms an SRA segment which images only between the Left and Center speakers, and links across the center with the SRA segment between the Right and Center speakers. Because of that, the imaging cues in the L/R segment, the L/C segment and the C/R segment do not conflict with each other upon playback. And therein lies some of the "magic". Playback with more than 3-channels uses various combinations of what I describe above around the array. For four channels only the central four microphones are used, which produces a 90 degree SRA between each quadrant. For five channel playback, the forward center microphone is added to those four in the same way it is added to the stereo pair in the 3-channel LCR example above. And so on up to 8 channels total. Williams intends this as a way for production to economically record stereo and surround content simultaneously, using one array. I share that goal, and although I don't need every combination, the concepts behind this are invaluable. I'd love to try variants on this and in some ways I have been doing so already for the last few years. In particular, since I originally came across this a few years ago I've been scheming on ways to mount a single cardioid 1.5 to 2 meters forward of the other mics, sort of like how I now fly the wide omnis out to either side. Imagine the photo above with only the four center mics and the one extending forward (okay, I'd keep the wide-spaced omnis, so it would look like the photo above without the backwards extending microphone). The main problem in doing that is anything extending forward or aft is difficult to manage at outdoor festival events where things are typically setup in rows of chairs, folks may pass carrying flag poles, totems, inflatable balloon critters on a leash or whatever. The omnis extending to the sides are in-line with the row of chairs and thus far less vulnerable than a forward (or aft) arm extending over the next row of chairs. I could possibly setup a second stand two rows forward of my main stand, or clamp to another taper's stand setup there, but getting the spacing adjusted correctly that way would be more difficult. Anyone here should be able to relate to those issues, even if running a simple 2-channel setup. Anyway, I just came across the image this morning (Posthorn is selling the mounting system for doing this using Schoeps mics, as well as doing 4 and 5 channel "star arrays"), which fired me up again about these Williams' Magic Arrays in particular, and although I've gone on an on about Stereo Zoom and MMAD at TS numerous times, I don't think I've ever really discussed "Magic Arrays" in much detail. It was sooo much simpler when you just had a mop handle with rabbit ears stuck on top to spread two mics. Simpler yes, but that part never went away! Well, I did trade the painter-pole/mop-handle for a Bogen stand, but that arrangement is still the basic foundation upon which all the other crazy stuff has grown. Asked to support the heft of the mighty TLs those little telescopic TV antennas would snap like a twig, unless you're talking TV transmitter tower antenna! You need one of those compact self-unfolding NASA-probe type trusses. Have you noticed that mop handles lately ain't what they used to be? Baltic Birch handles are the best sounding. I've little doubt Scandinavian design birch ply janitorials with the DPAs atop would mop it up most excellently, flooding the place with deep enveloping sound, plunging though crystal clear waves, no mud to muck about in but rock-solid bottom, atmospheric highs, and a tight-smooth midrange like the rippling abdomen of the Viking dude standing astride the bow, posed to leap ashore onto the New World of sonic bliss. You get those at IKEA?